The White House released the annual salaries for President Donald Trump's key aides on Friday. Although the figures for several senior aides represent a minor increase from President Barack Obama’s administration in 2012, their real incomes were slightly lower due to the faster pace of inflation. For instance, former Obama Chief of Staff Jacob Lew reportedly earned $172,200 — adjusted for inflation that would be about $183,378 today. Five suicide bombers attacked Lebanese soldiers searching for militants in refugee settlements near the border with Syria on Friday, the army said, and the explosions killed a girl and wounded a number of soldiers. by AFP - BEIRUT: A child was killed and seven Lebanese soldiers wounded on Friday when five militants blew themselves up and a sixth threw a grenade during raids on two refugee camps near the Syrian border, the army said. The civil war, which has raged in Syria since March 2011, has triggered an exodus of more than 1.1 million refugees into neighbouring Lebanon and has repeatedly spilt over. Four of the suicide bombers struck in the Al-Nur camp near the border town of Arsal, the army said. A young girl, whose parents are both refugees, was killed and three soldiers wounded, the army said. A medical source in the provincial capital Baalbek said the girl was two and a half years old. Troops recovered four explosive devices. During a raid on another camp near Arsal -- Al-Qariya -- one militant blew himself up and a second threw a grenade at troops, wounding four of them. The raids, which are aimed at "arresting terrorists and seizing weapons," were still continuing in mid-morning, the army command said. A military source told AFP that troops made a number of arrests. "The objective of the operation was to arrest a wanted man and it was this man who was the first to blow himself up," the source said. There have been multiple clashes along the border between the Lebanese army and jihadists of the Islamic State group or Al-Qaeda. In August 2014, the army clashed with jihadists of IS and Al-Qaeda's then Syria affiliate Al-Nusra Front in the Arsal region, with militants kidnapping 30 Lebanese soldiers and policemen as they withdrew back along the border. After long and arduous negotiations, 16 of the kidnapped men were released in December 2015 in exchange for Islamist prisoners held in Lebanese jail. The jihadists executed four of their hostages while a fifth died of wounds he suffered in the initial Arsal clashes, leaving nine members of Lebanon's security forces still in their hands. Since 2014, both the Lebanese army and Shiite militant group Hezbollah have carried out attacks on Syria-based jihadists in eastern Lebanon. Hezbollah has intervened in the war in Syria in support of President Bashar al-Assad, sending tens of thousands of fighters. Its strongholds in Lebanon have been hit by several deadly attacks claimed by IS. by AFP - BISRI, Lebanon: Lebanon’s government says a dam planned for a valley near Beirut is vital to tackle chronic water shortages, but the location on a seismic fault line has raised fears among residents. “How can you build a dam in an earthquake zone? We don’t even have houses that are earthquake-proof,” said Amer Meshmushi, a resident of Bisri Valley, 35 kilometres south of Beirut. He grew up hearing about the last major earthquake on the Roum fault, in 1956, which killed 135 people and damaged thousands of houses including his family home in Basaba village. “My brother was still little, and they had to drag him out from under the rubble,” the 50-year-old recalled his parents telling him as a child. Lebanon’s government and the World Bank say the Bisri dam is desperately needed to address water shortages afflicting greater Beirut’s 1.6 million residents. They insist the structure will be safe and say measures will be taken to mitigate seismic risks. But Meshmushi’s concerns are shared by local activists, including Raja Noujaim, head of the Association for the Protection of the Lebanese Heritage. “When we look at the region’s history and geography, we see that all of its valleys are the result of the fact that it is a seismic zone,” he told AFP. Activists say an earthquake could cause the dam to burst and that the structure and its reservoir would put pressure on the fault line and increase seismic activity. ‘Wiping out farmers’ The World Bank and Lebanon’s Council for Development and Reconstruction (CDR), a government agency that supervises major infrastructure projects, identified the valley as a prime location for a dam thanks to its abundant water, wide basin and proximity to Beirut. In a report, the World Bank said a panel of four “internationally recognised experts” recruited by the CDR had reviewed safety studies, adding that the dam’s design was “consistent with international best practice”. The World Bank told AFP that tests showed the dam had “a resistance to shocks above the one provoked by the 1956 earthquake,” which measured a six on the Richter scale — similar to the strength of the quakes that devastated central Italy last year. Eli Mussali, the CDR engineer overseeing the project, said the dam could “withstand earthquakes up to eight on the Richter scale, which is a very high degree.” He also downplayed the possibility that the structure could provoke seismic activity, saying there was no evidence for such a phenomenon. And he noted the country’s largest dam, in the eastern region of Qaraoun, is situated atop the major Yammouneh fault line. “It is geologically normal for faults to run between mountains, where rivers run and dams are built,” he said. By Andrew Doran - newsweek.com -Al Qaa, Lebanon -- On the morning of June 27, 2016, Yosef Farris awoke, like most in the Christian town of Qaa, around 4:10am to the sound of an explosion. A policeman, he rushed toward the town center. On the way, he heard a second explosion. Then a third. By the time he arrived at the scene of the explosions, he saw what little remained of his brother, George. Moments before, George, a Lebanese Armed Forces (LAF) veteran, had tackled one of the suicide bombers to the ground. The bomber then detonated his bomb, killing them both. George almost certainly saved lives, but his wife Donia, standing nearby, was critically wounded in the blast. Yousef rushed to his sister-in-law, whose torso had been ripped apart. Moments later a fourth suicide bomber emerged, who was shot and wounded, though he still managed to detonate his vest, injuring several more citizens of Qaa. By 4:30am, the town had endured four suicide bombers in an area of perhaps fifty yards. The attacks claimed five lives, including George, and wounded nineteen. The terrorists weren't finished. 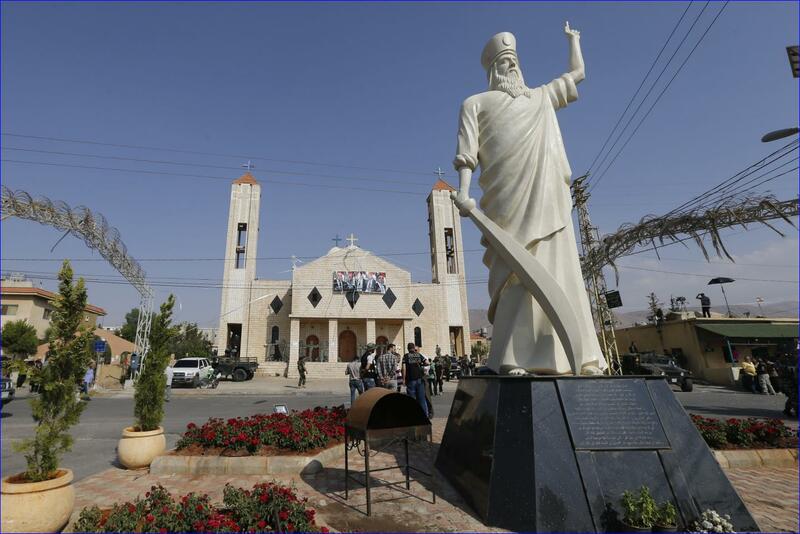 Several hours later, as Qaa was tending to its wounded and mourning its losses, four more suicide bombers attacked, this time closer to the town center, where a statue of St. Elias stands. The police suspected they'd been hiding in a nearby alleyway. The first ran past the statue toward St. Elias church. Seeing that he was a terrorist, policemen shot him dead. Three more emerged in rapid succession, blowing themselves up and wounding thirteen more residents. One year after the suicide bombings, a monument to the five men who were killed stands near the St. Elias statue. Yosef does his best to care for George's widow, who needs constant medical attention, and his brother's two children. In Yosef's home, in the company of family, there is anxiety over Donia's medical care. Her bills after three months were over $200,000. "If you don't have money or insurance, you die at the hospital door," the interpreter says. Some philanthropists in Lebanon's Christian community are helping the surviving families of the Qaa attacks. Qaa has now become a symbol for the courage of Christians of Lebanon--and not for the first time. During Lebanon's civil war (1975-90), Qaa's Christians were the target of sectarian attacks and, later,on the receiving end of regime brutality during the Syrian occupation, which only ended in 2005 after the Cedar Revolution. To the East of Qaa is the Anti-Lebanon Mountain range, beyond which is Syria. In the mountains, perhaps two miles from Qaa, are several hundred ISIS fighters, who are suspected of carrying out the attacks. ISIS, or Daesh as they are called in most of the Middle East, are largely encircled by enemies near the Syrian border but remain a threat to Qaa. Three miles to the North is the Syria, whose regime murdered scores of Qaa's Christians, including the father of the current mayor in a purge in 1978. To the South and West are areas sympathetic to or controlled by Hezbollah. It's not enviable geography. "We will never abandon Qaa," said Qaa's mayor, Bachir Matar. "For forty years we have been attacked. One hundred fifty of our people have been martyrs. First the Palestinians, then the Syrians, and now Daesh. We won't be driven out by Daesh." He is busy with local leaders planning a prayer vigil at 4:30am the next day to commemorate the anniversary of the attacks and Qaa's victims. The five men killed by the suicide bombers were all LAF veterans. "Eighty percent of the men have served in the armed forces," says George Saad, the ranking policeman on the scene. Even many of the women of Qaa, who were photographed in the aftermath of the attack wielding Kalashnikovs, have served in the military. For more than six years, Lebanon has avoided being dragged into the Sunni-Shia struggle that has engulfed much of the region. 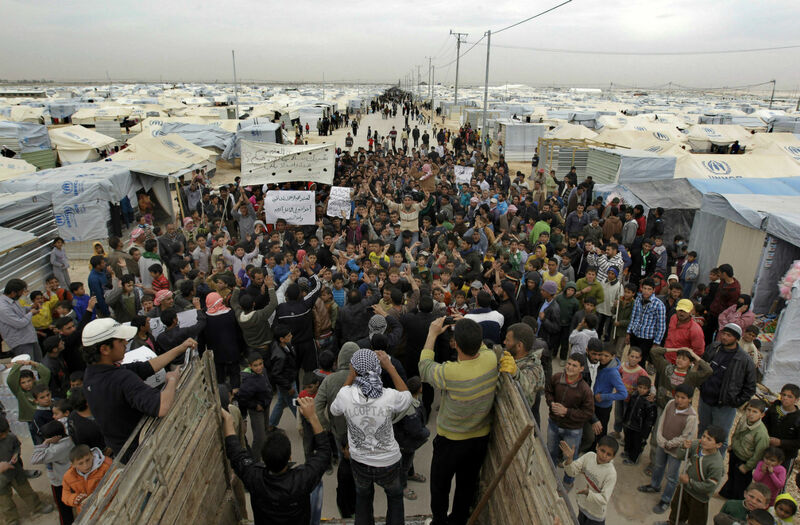 However, the Syrian refugee crisis threatens to destabilize Lebanon, which would compound the region's refugee crisis. Lebanon has the largest per capita refugee population in the world, which threatens to upset Lebanon's fragile demographic--and political--equilibrium. Further concerns about instability in Lebanon emerged when the Trump administration announced its plan to cut funding to the LAF, a move that experts fear could strengthen, not weaken, Hezbollah and regional power Iran. Many in Lebanon say, "Lebanon is the front line for the West." If Lebanon should be overrun by Islamists, they believe Europe will be next--making the terrorist attacks of today seem mild by comparison. 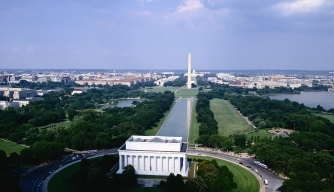 The comparison with the West is frequently on the minds of the citizens of Qaa. "The British had three terrorists over many weeks," says Matar. "In Qaa, we had eight in one day. And we saw to it ourselves." Yosef voices a similar sentiment. "America had nineteen attackers and that led to a global war. We had eight and no one even knows about it." The isolation of Qaa may be both psychological and proximate, but they remain heroes in the minds of the Lebanese people, who long for the fragile peace to hold. by Paul Astih - Beirut – Government and parliamentary workshops are expected to be held in Lebanon after the Eid al-Fitr holiday in line with the outcome of the consultative meeting, which was held last week at the Baabda Palace, in parallel with the preparations for the upcoming parliamentary elections in May 2018. Deputy Prime Minister and Health Minister Ghassan Hasbani is supervising several files which will be tackled in the coming ministerial meetings, including the activation of infrastructure projects, the electricity and the garbage file, as well as the 2018 budget. In remarks to Asharq Al-Awsat newspaper, Hasbani underlined the importance of holding cabinet sessions in various governorates, in order to boost cooperation between ministries on important infrastructure projects. “It is the first time in Lebanon that we see a comprehensive plan aimed at dealing with infrastructure issues,” he stated. Hasbani noted in this regard that he has held a series of meetings with 1,100 municipalities across the country, with whom he set out a list of priority projects, adding that ministerial meetings in the different governorates would be held as of end of August or beginning of September. The cabinet, according to Hasbani, would extensively work on drafting an economic plan that would represent the basis of the 2018 budget, after the referral of this year’s budget for parliament’s approval. He added that the garbage crisis would be also be resolved during the upcoming ministerial meetings. by reuters - HONG KONG/LONDON, June 26 (Fitch) The agreement on a new electoral law for Lebanon avoids a political crisis, but highlights the limitations of the country's sectarian-based political system, Fitch Ratings says. Lebanon's parliament approved the new law on 16 June 2017, following cabinet approval of a cross-party agreement to adopt proportional representation and reduce the number of electoral districts. Elections had been due by 20 June, but parliament will now be extended again while preparations are made for a vote under the new system in May 2018. Changing the electoral law to facilitate elections is another step towards improving political effectiveness, following the election of Michel Aoun as president last October after more than two years without a president, and the formation of a new government, drawn from across the political spectrum, in December. It has averted an impending political crisis, as Aoun had effectively set a 20 June deadline, and illustrates the ability of the main political factions in Lebanon to achieve compromises, albeit slowly and at the last minute. Maintaining this modest political momentum could further improve the prospects for policy making. The current government has largely been occupied with electoral law discussions, but it has also reinvigorated the oil and gas licensing process and agreed on a 2017 Budget, although this has not yet been approved by parliament. But repeated delays in the political process - the 2018 elections will be the first since 2009 and the new budget is the first state budget approved by a cabinet for 12 years - illustrate the constraints of Lebanon's sectarian political system, which have been made worse by the Syrian civil war. The new electoral law is unlikely to significantly change this system. Government formation after next year's election may once again be a drawn-out process. High and persistent political and security risks are reflected in Lebanon's low sovereign rating, affirmed at 'B-'/Stable in February 2017, alongside high public debt and anaemic economic growth. Political progress since November appears to have boosted the Lebanese diaspora's confidence in the country's economy. Deposit growth was 8.2% yoy in April 2017, sufficient to fund government borrowing, which depends on the channelling of deposits and remittances via the financial system, and ensure moderate credit growth to the private sector. Foreign-exchange deposits were 11% higher than a year earlier, and gross foreign-exchange reserves were 7.6% higher, although they had declined from February and March levels. Deposit growth may have been boosted by Aoun's election and the formation of a government, having dropped to less than 5% yoy for much of 1H16. However, reserves and deposits had also been boosted by a financial engineering operation by Banque du Liban (BdL), which sold eurobond holdings and foreign exchange-denominated certificates of deposit (CD), worth around USD13 billion to banks over several months last year. At the same time, BdL offered to discount at a premium equivalent amounts of Lebanese pound T-bills and CDs held by banks. The operation buoyed growth in non-resident deposits, as banks offered attractive conditions for foreign-exchange deposits to participate in BdL's operation. The risk is that as the effect of this operation wanes, deposit growth will again come under pressure. Recent political developments can help sustain positive sentiment, but rising public debt, up 8.6% yoy in March 2017, means that Lebanon remains vulnerable to a recurrence of political paralysis that dents confidence and deposit and remittance flows. Tougher US sanctions against Hizbollah could also directly or indirectly affect foreign flows into Lebanon and its banking sector, although these have not yet been formally proposed as a bill.